The height of this moonth cycle comes on the March 20th full moon, and offers a revelation about how the lunar energies initiated on March 6th by The Moon traveling through the Nine of Water with the attitude of the Explorer of Water are developing within us. Out of the revelation, we are issued an invitation to return a gift to the world in the final weeks of the lunar cycle. To add some extra energy to this full moon, it arrives on the Equinox when day and night are of equal length all across the globe. Here in the Northern Hemisphere, the days will grow in length as we depart from the Equinox threshold into Spring. In the Southern Hemisphere, the balance tips toward Fall. This alignment of full moon and Equinox is a rare but fairly regular occurrence; it happens about every 19 years. Let the uniqueness of this moment inspire you to take a sacred pause in your day to honor this celestial alignment. Let the regularity of this moment inspired some reflection: What were you doing on March 20, 2000? What would gifts would you like to have offered to the world by March 19, 2030? At this time of balanced light and dark, it is no surprise to see that full moon comes in the sign associated with the Tarot’s Justice card. Balance, Karma, Truth, and Right Relationship are key concepts associated with the Tarot’s Justice. 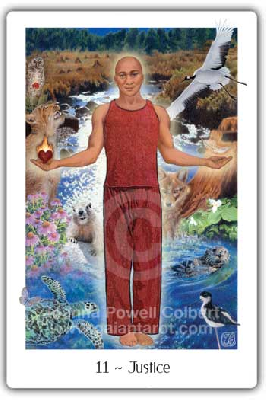 In the Gaian Tarot shown below, Justice reminds us of our need to live in right balance with not just the human world but the whole of creation, and calls us to consider the long-term impact of the choices that we make today. While the work of Justice is essentially collective – it happens in relationship and through institutions – inner work is foundational to Justice. Self knowledge, practices that support us in times of difficulty, and internal equilibrium, for example, aid us in being effective, resilient advocates for the on-going work of Justice. The energy of the March 6th new moon’s traveling through the Nine of Water invited us to do this inner work and begin our emergence into the light of spring. Take a look at Justice and the Nine of Water woman together. You will see that these figures are mirror images of each other. They show us different sides of the work of soul path walking. 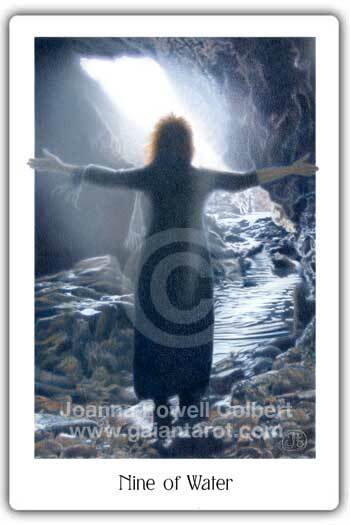 The Water woman on her lunar path is in shadow, doing her inner work, preparing for emergence. As we are on the cusp of spring, I see this figure as like Persephone, who has been changed by her time in the Underworld with the Beloved Dead. When the time is right, she will return with the seeds of the Underworld in her belly to spark earth’s return to life and growth, bringing a new balance. The Justice man, however, shows us his face in full light to offer his message immediately and directly: Speak the truth. Do nothing that leaves a weight on your heart heavier than a feather. Take action to care for this world and those in it. The whole of Justice includes both the shadowy work of inner transformation and the clear and active work of action. Bring out a Justice card from a Tarot deck and connect it to your new moon reading / reflections. Make this card the start and/or the end of the sequence and adds its meaning into the story the cards are telling. What service to Justice is suggested by your cards? What will you do before the next new moon to act on this suggestion? Moon bathe by sitting or lying under a window or outside on the ground. Let go of your thoughts and soak in the light. Contemplate Persephone’s story as the traveler between the worlds and connect with Her energy to explore what seeds are you bringing from the dead (out of winter) that will become your new growth of spring. You can look through cards already pulled and make connections or pull new ones. When you are done, remember to offer gratitude for what you have received. Consider what gift you now want to return to the world. Pulling a card for guidance on what this gift is always a fine thing to do. In the coming weeks and before the moon returns to dark around April 4th offer your gift to the world.